5. 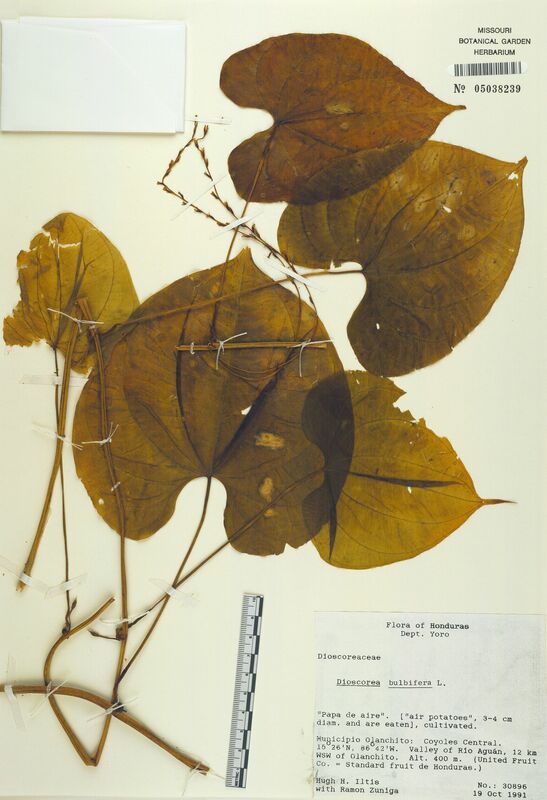 Dioscorea bulbifera Linnaeus, Sp. Pl. 2: 1033. 1753. Plants tuberous or not; tubers, when present, buried just below ground surface, not stalked, globose, weighing less than 1 kg. Stems twining counter-clockwise, climbing to more than 20 m, often flecked with purple, unwinged or rarely narrowly winged, terete, producing axillary bulbils frequently greater than 5 cm in diam. in leaf axils. Leaves alternate throughout, 5–25 × 5–26 cm; petiole usually somewhat shorter than blade, base clasping, basal lobes stipulelike, 1–4 mm wide; blade 5–11-veined, broadly ovate-cordate, glabrous, base orbicular, margins entire, apex long-acuminate. Staminate inflorescences axillary, borne singly, spicate or paniculate, cymose, to 70 cm; cymes reduced to 1 sessile bracteolate flower, internodes ca. 2 mm; secondary axes to 6 per node, fasciculate, subtended by deltate bracteoles or sometimes leafy bracts, 3–20 cm. Pistillate inflorescences borne singly or fasciculate, to 6 per axil, spicate; spikes bearing to 50 flowers, 6–40 cm, subopposite to 8 mm apart. Staminate flowers fragrant; perianth white, becoming purple; tepals in 2 similar whorls, spreading at anthesis, lanceolate, (1–) 2–5 mm; fertile stamens 6 in 2 equal whorls; anthers as long as or longer than filaments; thecae distinct, not spreading. Pistillate flowers: perianth greenish white, not changing color; tepals as in staminate flowers; staminodes 6, smaller than fertile stamens. Capsules not reflexed at maturity, longer than wide, 1.8–2.8 × 1–1.5 cm. Seeds unilaterally winged, 12–20 mm. 2n = 80, 100. Flowering late summer--early fall. Near ponds, marshes, drainage canals, disturbed woods and thickets, waste areas; 0 m; introduced; Fla.; tropical Asia; tropical Africa. Dioscorea bulbifera is the most widely distributed of all Dioscorea species. It is found throughout the tropics and is thought to be native to both Africa and Asia. The tubers are either small and bitter or do not form at all. The bulbils are eaten, although this species is not widely consumed outside of Oceania. It is weedy in Florida and probably elsewhere in the Gulf States, but I have not seen any specimens to document its range outside Florida. Plants in the flora area rarely flower, and those that do are usually pistillate; I observed no staminate flowers.